Сегодня я снова к вам с открыткой, и не для ДК, а просто так, по вдохновению! Давно такого не было, и надеюсь теперь будет постоянно! Очень хочется появляться в блоге чаще и делиться своими работами. Today, I am back to you with a card, and not DT, but just for the inspiration! For a long time this was not, and I hope now is the time! I'd like to appear in the blog more often and share their work. На самом деле, на первом месте в ТОПе вдохновения для меня стоят тематические задания, дальше скетчи и в последнюю очередь цветовые палитры. Редко я делаю работы именно по ним. А тут очень захотелось и так же быстро сложилось. In fact, in the first place in the TOP inspiration for me are thematic jobs, more sketches and finally the color palette. Occasionally I make it work for them. And here very much wanted and just as quickly formed. Сделала открытку по палитре от Waffle Flower. А задание увидела у Даши Грушиной, которая является дизайнером в этом блоге. Тем более, что штампы и ножи которые я использовала совсем новые, нужно скорее делать с ними прекрасные открытки. I make a card on the palette of Waffle Flower. A task saw at Dasha Grushina, who is the designer of this blog. Especially because the stamps and dies which I used quite new, to do most lovely greeting card with them. 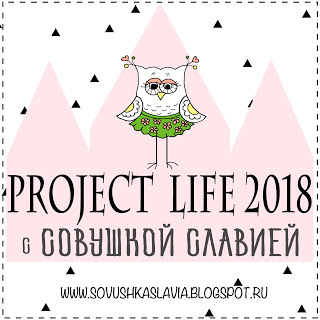 Для открытки я использовала довольно распространенный скетч. Мне кажется, такое расположение элементов это беспроигрышный вариант для любой поздравительной открытки. For card I used a fairly common sketch. I think this arrangement of the elements is a win-win for any greeting card. But then everything is easy. Background made using watercolors, caused horizontal bands of light blue color. By the way, this is a trick in store is also quite popular. Flowers stamped according to the color palette, the die cut a circle from the Lawn Fawn, was added and the composition of the sentiment Altenew, Drops and sequins on Pretty Pink Posh. 1. Addicted to stamps challenge. Challenge 208 holiday. This is so pretty! Thanks for joining us at the Waffle Flower Challenge! Thank you so much! 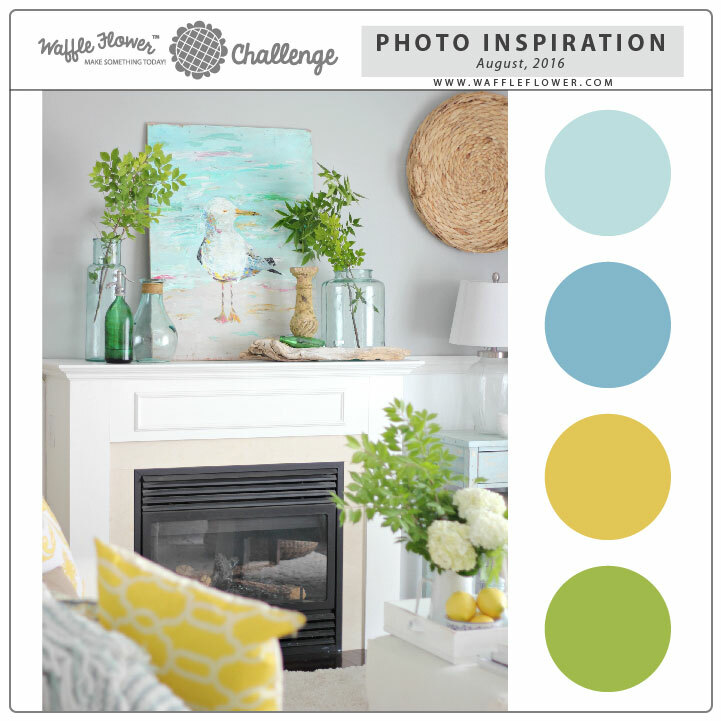 This Challenge is very exciting! Oh, so sweet! I really like your card, delicate and elegant, it doesn't need anything else! Rosa, thank you very much! I am very pleased! Such a soft and pretty card. Love it! Thanks for joining us at the Waffle Flower challenge this month. 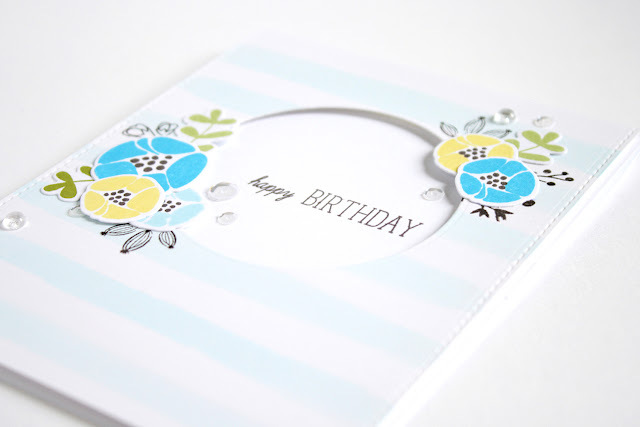 LOVE the mix of black outlined stamping and the colored stamps:)) Thanks for linking to the Waffle Flower Crafts Challenge! 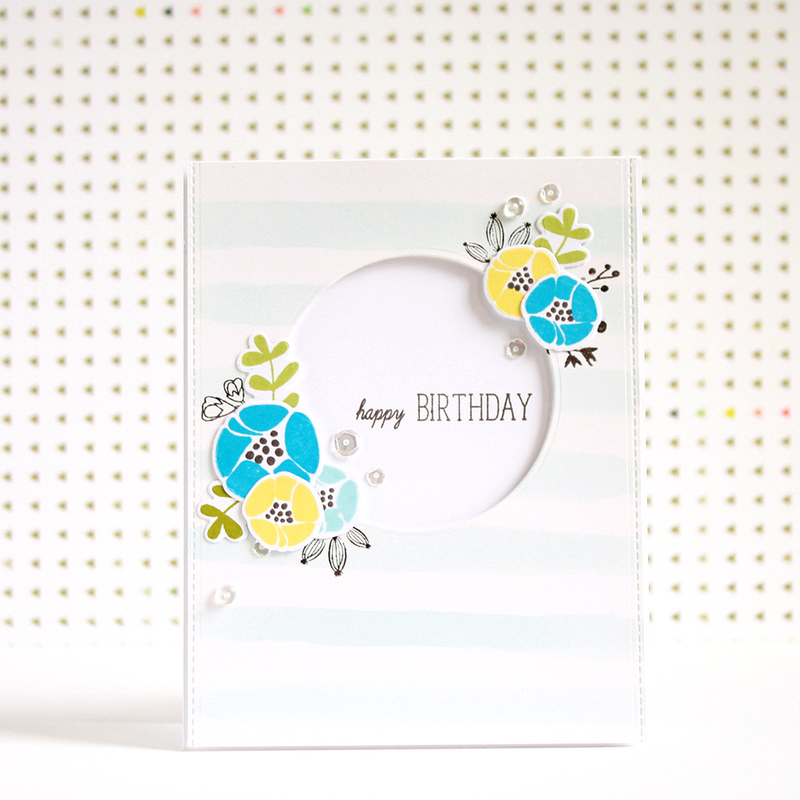 Oh such a sweet soft pretty card! Thanks for joining us at Waffle Flower Crafts!